Producing complex aerospace parts such as vanes, blisks, and impellers requires a particularly fast, very precise, and extremely dynamic machining center. Manufacturing operations for these special components used in engine and turbine construction require 5-axis machining. This 5-axis machining concept is becoming increasingly important, not only within aviation, but across all industry segments. Machines for highly dynamic milling with five simultaneously controlled axes are simply indispensable for construction of aircraft engines worldwide. Precision, jerk control, and acceleration are all fundamental factors within aerospace manufacturing. As an expert in the field of CNC-controlled vertical milling and turning centers, the CHIRON Group has brought a machining center to market maturity that is precisely matched to the special requirements of the aviation sector: The FZ 16 S five axis with 5-axis tilt rotary table. The mineral cast machine bed, with new gantry design excels through its high degree of stiffness, and thereby also delivers optimum damping characteristics. High-performance motors, two Y-axis drives, as well as short spindle start-up and braking times lay the foundation for the machine's extreme speed. A-axes and C-axes equipped with direct drives deliver even greater dynamics. Turnkey machines are particularly important for the aerospace sector. These complete solutions with end-to-end automation are matched to individual customer requirements. 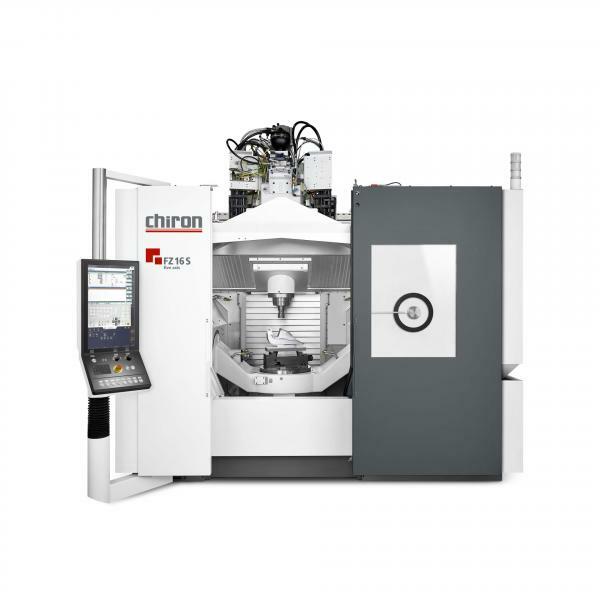 The CHIRON Group sets important key focuses here, as the corporate group generates more than a third of its revenue with turnkey machining centers every year. In addition to the holding fixture and selection of the right cutting tools, the software provided also makes a contribution to greater productivity and dynamics in machining for customer solutions of this kind. The software systems in the SmartLine portfolio from CHIRON establish the ideal basis for making full use of the performance offered by the machining centers. For example, maintenance work and repairs can be planned in a targeted way with the ConditionLine IT system, which allows productivity to be significantly improved. This is because the software always detects signs of wear, as well as atypical behavior early on during operations, which helps prevent costly downtimes before they occur. In terms of CNC control systems, customers can choose between the established solutions in the market from Siemens, Fanuc, or Heidenhain - all of which support the best possible machining quality and performance. The types of materials to be processed are the main factors that make the requirements in the aviation industry so special. 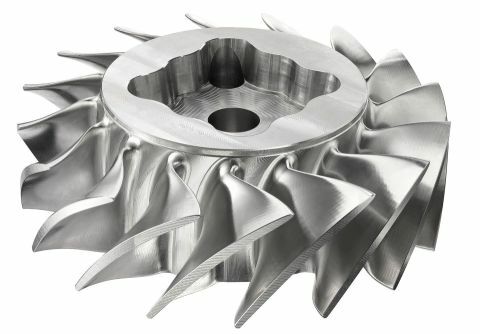 After all, vanes, blisks, and impellers are typically produced from high temperature resistant materials such as titanium, corrosion resistant Inconel nickel-based alloys, or stainless steel. However, the complex 5-axis geometries of the materials also need to be produced with precise surface form. For example, a blisk (short for "blade integrated disk") consists of up to 120 individual blade components on a disk and has a diameter of around 800 millimeters. Workpieces of this kind can only be produced on a fast, very precise, and highly dynamic machining center, such as the CHIRON FZ 16 S five axis. Along with meeting strict requirements in terms of precision and dynamics, the machine is capable of machining particularly large, yet also demanding and complex workpieces. "Blisks have already been machined from Inconel within the scope of a current project on the premises of one of our major customers in the sector," reports Markus Löhe, Aerospace Sales Engineer at CHIRON. "The new FZ 16 S five axis actually delivered excellent results right from the first workpieces," summarizes Löhe.